We are a family run business, the owner of which, Vassilios FILDISIS, has been selling Alfa Romeo's genuine car parts since 1993. 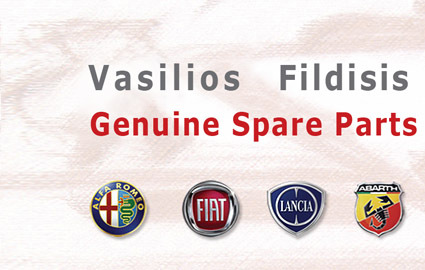 We have been providing our clients with Fiat, Lancia and Abarth genuine car parts since 2001. Our aim is to give you very competitive prices together with a speedy 24-72Hr door to door delivery service wherever you want it in Greece. We hope you enjoy the ease of purchasing your parts online along with our excellent customer service. We offer you a vast range of Original Boxed Alfa Romeo, Fiat, Lancia and Abarth spare parts. In order to suit all budgets, we also provide quality replacement Alfa Romeo, Fiat, Lancia and Abarth parts from major European component manufacturers, such as SKF, Magneti Marelli, Bosch, Dayco, Boge, Valeo, Bendix etc. For older models, for which no new parts exist, we also provide you with used parts in cooperation with used-car- parts businesses in Greece and in Italy. For those of you who would like to visit us, our address is 32, Nirvana str, postcode 11145 Athens- Greece.